Ibrox Noise: Is Ryan Kent worth £7M? Is Ryan Kent worth £7M? So tongues were set wagging yesterday over the big revelation around on-loan Ryan Kent, whereby the Liverpool winger’s fee was (more or less) officially set at the £7M+ mark. The response, universally we have to say, from our supporters, was a big fat ‘no’. 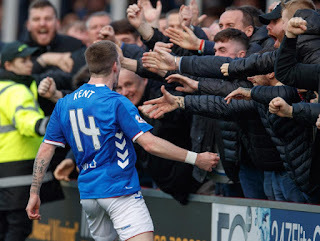 The reality is Kent’s reputation in our shirt has come as a result of four or possibly five stonking displays – Rapid, Hearts and Celtic standing out by far the most. He was unplayable in these matches and single-handedly destroyed the opponent. It was thrilling, breathtaking and utterly adrenalizing to see a Rangers player lay several gloves on tough opponents and KO them. On that form alone, in fact, £7M is a steal in today’s market. Anyone witnessing those performances saw some of the most dynamic, technically gifted brilliant and destructive wing display possible – he was unreal. However, a handful of those performances from 37 appearances is not enough when the other 32 are borderline average. We know the wing position is dreadfully inconsistent – to become a truly world class winger sees a level of consistency in performance the majority in your position cannot emulate. It’s what sets the Arjen Robbens apart from the Vladimir Weisses. And that’s where Kent falls flat. His last truly great display was the 29th of December but since then? Some fleeting performances which flirted with being impressive but which ultimately failed – Aberdeen at Pittodrie in early February saw him provide two assists and some energetic play but overall he lacked impact in that match – and that’s been much the way since the win over Celtic. In his defence, since returning from injury at the very end of last year he’s managed an outstanding 7 assists/goals in 8 league appearances, which in stats alone looks more than worth £7M+. But James Tavernier’s managed a tonne as well yet few would suggest he’s Cafu either. The problem ultimately is the price – we reported that Liverpool would expect around at least £5M, and with luck they’d give Rangers ‘friends rates’ with the obvious connections. But the brutal truth is they’re not interested in doing Rangers a favour – it’s been the other way around. We’ll have more on that later. But Rangers and Steven Gerrard have to decide if Kent is worth the money Liverpool are asking. For Ibrox Noise? It’s a definite no. Never! I like him, would liked to have seen him staying but no way is he worth £7m. If we have £7m to spend I would rather see us sign 2 quality attacking midfielders. We have another 3 left wingers! Yes, he's had a mixed season but has shown his quality. He's young and English so £7m is fair. Is Worrall worth £10m? Someone has bid that and failed. Kent has had more of an impact for us than Worrall. A more accurate question might have been is he worth £7 million to us? He will be worth more than £7 million to a championship team, as they have a lot more money than us. He is not worth that to us, unless we got offered £6 million for Middleton, or £4 million for Jones. Neither is going to happen this summer. True. They're only worth what someone is willing to pay. But you never know he might dig his heels, by all accounts it's the 1st place he's been enjoying his football. He may not want to risk moving somewhere and get dropped. Maybe Liverpool would deal with a lower fee and a higher sell on. I’d like to keep him but I wouldn’t want to spend £7m to do so. He’s only really proved anything up here and £7m just isn’t then going rate for a good SPL winger who’s played 30-odd games. £7m will buy us 2 or 3 decent players. We already have Murphy and Middleton who can play there and Jones will arrive in the summer. At their best they may not be as good as Kent at his best but maybe they can provide a bit more consistency to make up for it.